Traditional neighborhoods support vibrant, healthy, community living. After decades of experimenting with other models of city-making, American planners and designers are now relearning the old lessons. They're calling it Traditional Neighborhood Design, and the Schenk-Atwood neighborhood has had it all along. When the world-class designers (Duany/Plater-Zyberk) of the nearby innovative Middleton Hills traditional neighborhood project looked for a working local example to study, they came to Schenk-Atwood. A genuine neighborhood is a complex thing, an 'urban ecosystem'. Planners can only design the physical part of a neighborhood; it's up to the inhabitants to breathe life into it. We make it our place, our community. But the way in which a place is designed and built, the physical form, can either support us or hinder us. Recently the Schenk-Atwood neighborhood has made a comeback. This piece of land next to Lake Monona has always been graced with great natural beauty (the original Native American inhabitants' name translates roughly as "just a little less than paradise"). But what has made this area stay a viable urban neighborhood for the better part of a century, a good place to live, in lean times and good times? Here are the basic building blocks that create a real neighborhood, give it a strong identity, help make it a place to care about. Here's what makes Schenk-Atwood work as a neighborhood, and what makes it special, as a traditional neighborhood designer would see it. An authentic neighborhood mixes - close together - the full range of human activities: living, learning, working, playing, creating, worshiping. Schenk-Atwood has for most of it's history taken a common-sense, inclusive approach to mixing adjacent uses. Housing is kept more affordable with a range of different types: small and large single homes and two-flats, multiple unit buildings, businesses with apartments above, a few CBRFs (Community-Based Residential Facilities). Our neighborhood industries, often located right next to homes, work hard to be good neighbors. Clear edges make well defined places, places with character. Our boundaries also connect us to the surrounding neighborhoods. 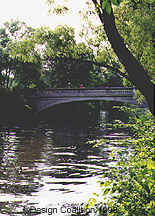 To the west is the Yahara River, to the east, Olbrich Park lands; both form natural gateways. To the south are the shores and bluffs of Lake Monona. The northern neighborhood limit is approximately the curve of the railroad track. This is a 'soft' edge that knits Schenk-Atwood into the rest of the city. The neighborhood west entrance and the Eastwood bypass. The neighborhood east entrance. 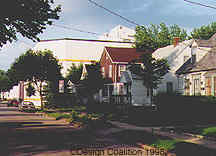 The shape of the neighborhood sign echoes the botanical conservatory building. 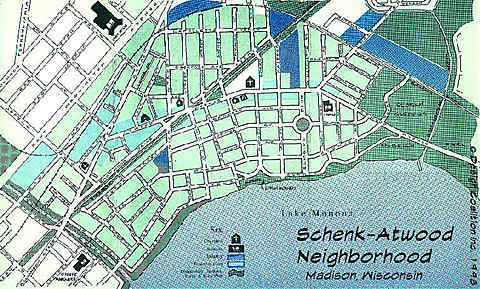 Physically, Schenk-Atwood is a walkable size for a neighborhood. We can walk to school, to the grocery, to restaurants, to bus stops close by. Size and density together are crucial factors for a neighborhood to work well. A walkable neighborhood allows children, older people, and non-drivers to be active and independent. *The calculation includes just the blocks themselves, not streets or other public lands. It's difficult to imagine a long-lasting, cohesive neighborhood without a school. In fact, the location of schools often serves to define neighborhoods. 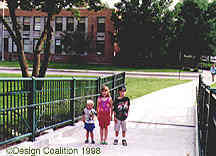 Lowell School at the eastern end of the neighborhood was one of Madison's earliest, and most progressive, public elementary schools. 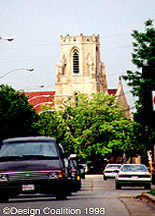 Marquette, O'Keefe and East High schools lie at the neighborhood edges. The neighborhood also boasts several active churches, and the centrally located Atwood Community Center. 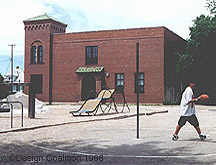 Atwood Community Center. 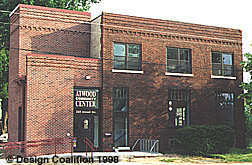 One of Madison's oldest community centers, Atwood provides programs for children and seniors, organizes the annual Atwood Festival, and publishes The Eastside News. It is the shared common places that most clearly show the character of a community. Here is where we rub shoulders as citizens. Schenk-Atwood's common places are typically informal and down-to-earth: the bike path, the community vegetable gardens, the streetside flower gardens tended by volunteers, the Atwood Festival as it takes over Schenk's Corners for a day, the sidewalks, the parks and beaches. 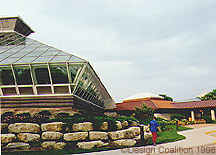 Olbrich Park & Bolz Conservatory. The volunteer Olbrich Botanical Society has many neighborhood residents active in the care of the lovely flower gardens. Yahara Place Park. 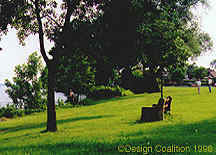 This park was part of John Nolen's plan for Madison to ensure public accessibility to the lakes. Atwood Avenue is the neighborhood's 'Main Street'. Healthy businesses are vital to a durable neighborhood, businesses located at the core. 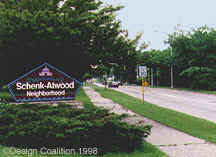 Schenk-Atwood businesses provide employment and most daily needs close by; that means fewer car trips and less traffic. Many of our businesses offer unique services that attract customers from far outside the neighborhood. 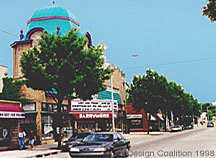 The reopening of the Barrymore Theater over a decade ago as a venue for live entertainment catalyzed a revitalization of business in the Schenk's Corners area. Barrymore Theater. The Barrymore anchors a growing arts district, which includes Tap-it dance studio, Harmony Bar, and various artist's studios. 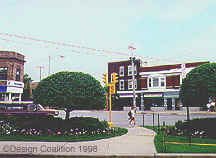 Schenk's Corners business district. Note apartments and offices above the street-level shops. Modern zoning codes and planning practice, which stopped supporting this time-tested pattern of urban (and affordable) living, are currently being re-examined in Madison. 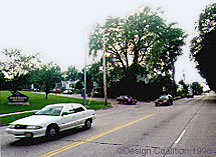 Suburbs are laid out as cul-de-sac streets that feed wide, fast collector streets. 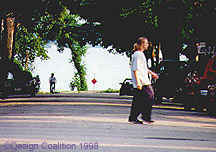 The result too often is congestion and unsafe streets for bicycles and pedestrians. Our grid of streets works better. 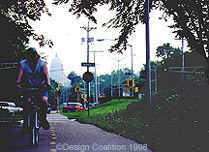 There are always several alternative routes to take, always a route less traveled for bikes and walking children. Our narrow residential streets with on-street parking slow traffic down; many are only 26' to 30' wide. Vehicles are accommodated but without dominating. Urban designers call them 'vistas' and 'terminated axial views'. 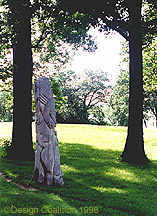 These are unique to Schenk-Atwood: the Effigy Mounds on the bluff above the lake when a low sun outlines their shapes, Lake Monona sparkling at the end of a tree-shaded street, the strong tower of St. Bernard's Church above the trees at the bend in Atwood Avenue, the distant Capitol dome lined up right over the new bike path, the ornate dome of the Barrymore Theater, the colorful confusion of coats and sleds on the snow of the Olbrich Park hill. These are memorable views. They are key visual references and at the heart of the neighborhood's identity and character.